Creamy, sweet and tart, this key lime ribbon cheesecake is the queen of summer desserts. The silky lime curd does double duty – as a filling and topping and invites you to drag your finger through it when nobody is watching. It’s that good! Creamy, sweet and tart, this key lime ribbon cheesecake is the queen of summer desserts. The silky lime curd does a double duty – as a filling and topping and invites you to drag your finger through it when nobody is watching. It’s that good! I can’t go too long without baking a cheesecake and sometimes I find an excuse to bake it twice in a month. For example, Easter was a great excuse and there were Romanian pasca and kataifi cheesecake nests. I sometimes squeeze in my absolute FAVORITE that is also my most POPULAR dessert (according to Pinterest) – tiramisu cheesecake. My husband rolls his eyes, but has no problem eating them all, ha! WHAT IS THE DIFFERENCE BETWEEN KEY LIMES AND LIMES? Persian lime (most common) has a thick rind, but Key lime has a thinner rind. 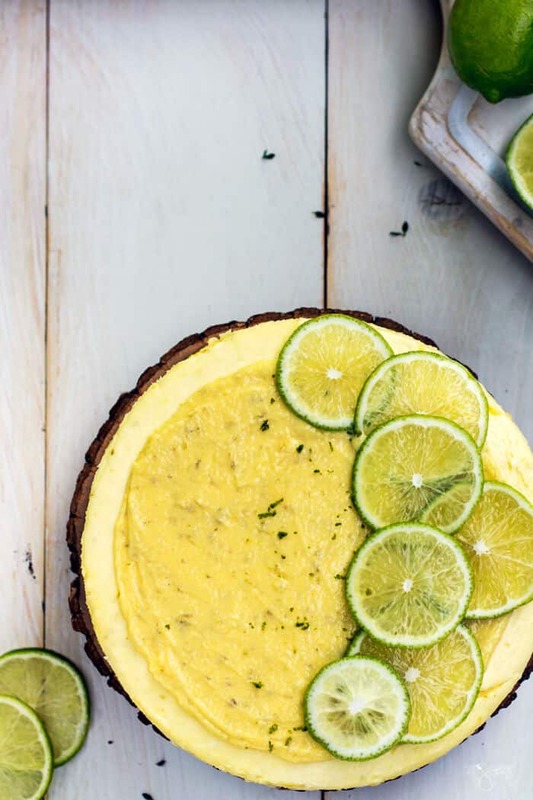 Key lime is sweeter than other types of lime. 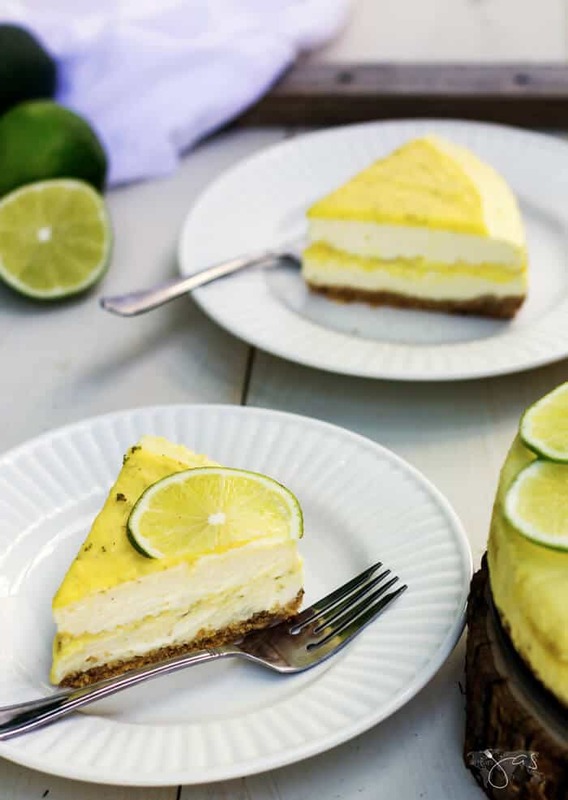 Key lime is smaller in size and volume than most other types of lime. Limes are dark green, but Key limes are more yellowish-green in color. Key limes, also known as Mexican or West Indian limes, are more acidic, more aromatic, and have a more intense floral flavor while other types of lime have less acid content and less intense flavor. Key lime has more seeds than other types of lime, and it is also best used to enhance drinks and beverages. SUMMER calls for fruity versions like the crustless lemon cheesecake that is super light and refreshing and no-bake kefir blueberry cheesecake that is also healthy. Here’s a hint – I’ll bake the next one with fruit as well. Another tropical fruit, perhaps. 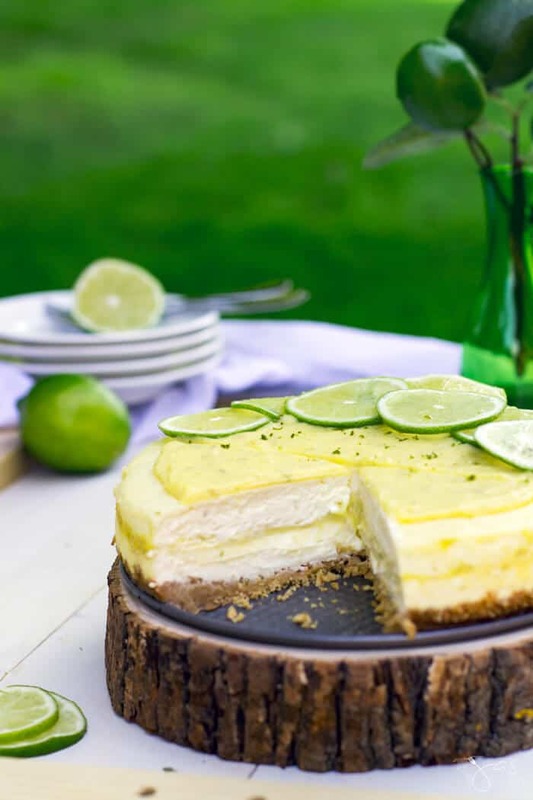 Key lime pie is summer favorite and if you like cheesecakes as much as I do, you’ll love this concoction with the lime curd ribbon in the middle. The steps for making a cheesecake always seem so daunting, but if you follow them in order, they flow pretty seamlessly. Even if the recipe is new like this one was for me. I’ve never used cornstarch and sour cream in my cheesecake and was afraid it wouldn’t set, but it turned out perfect and creamier than some. Wonderfully refreshing, this cheesecake is as pretty as it is tasty. With only one slice left, I’m ready for my next cheesecake adventure. Replace sugar with a sugar substitute that measures cup for cup, like Swerve. With an electric mixer, beat the egg yolks and sugar for several minutes until the mixture becomes thick and pale. Add the citrus juice and mix until blended. Pour the mixture into a heavy-bottomed stainless steel saucepan (do not use an aluminum pan as it would react with the juice and yolk). Add butter, salt, and lemon zest. Cook the mixture, whisking constantly, until thickened (about 10 minutes) and coats the back of a metal spoon. Do not let it boil. Transfer to a small bowl; cool 10 minutes. Refrigerate, covered, until cold. In a small bowl, mix the graham cracker crumbs with the melted butter together until evenly moistened. Press the crumb mixture onto the bottom of a 9-inch springform pan. Bake the crust until golden brown, about 10 to 12 minutes. Beat in the sour cream. Add the eggs, one at a time, beating well after each addition. Stir in the lime juice, zest, and salt; mix until just combined. Stir in the cornstarch. Pour half of the batter into the prepared pan. Spread 6 tablespoons of lime curd evenly over the top, and then carefully spread the remaining cheesecake batter over the curd. Wrap outside of the pan in a double layer of foil, covering the underside and extending all the way to the top. Place the wrapped pan in a large roasting pan and add 2 inches of hot water (or about halfway up the sides of cheesecake pan). Bake in 350 degrees Fahrenheit preheated oven until the top of the cheesecake is lightly browned but the center still jiggles slightly, about 50 minutes. Remove the aluminum foil and run a thin knife or offset spatula around the edges to release the edges from the pan (prevents it from being torn open). Allow the cake to completely cool on a rack then cover with plastic wrap and refrigerate overnight or at least 4 hours before serving. Open the springform pan and remove the ring. Distribute the rest of lime curd evenly on the top of the cake. Cut the cheesecake into wedges and serve with whipped cream if desired. 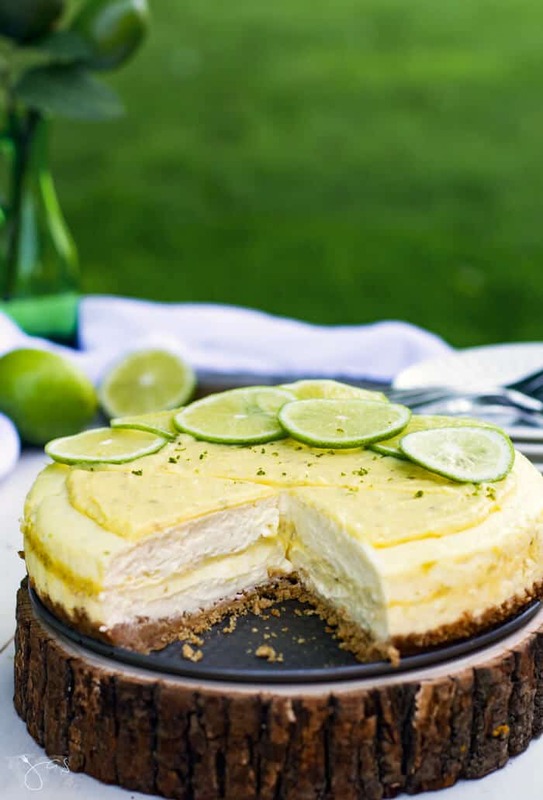 This key lime ribbon cheesecake combines two of the favorite classic desserts into one for the ultimate summer treat. 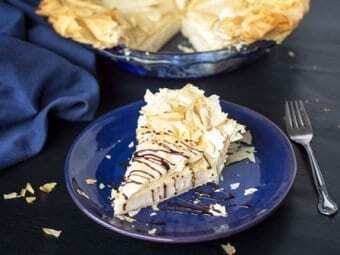 It is creamy, sweet, and tart and sure to impress! Featured on: Miz Helen’s Country Cottage, Lou Lou Girls, The Sweet Sensations, City of Creative Dreams, and A Delightsome Life. This looks gorgeous and I love the lime curd topping for extra zestyness! That cheesecake is absolutely gorgeous and it’s calling my name! Pinning this for later! Thank you, Michele! I’m thrilled you like it!!! How sad is this? I love key lime desserts/drinks, but have never made any myself. Positively shameful. This does look scrumptious, though. And you know I love cheesecake! I’m right there with you. Key lime pie is my favorite pie but I’ve never made one. I think this cheesecake qualifies so I can check it off my to-do list, ha! I would really enjoy a slice of your amazing Cheesecake right now. Hope you are having a great week and thanks so much for sharing with us at Full Plate Thursday! My word this looks scrumptious! I off to the store! Pinned. 😀 So glad you like it, Cindy! Enjoy your weekend! This looks and sounds amazing!!Pinned! This looks delicious! Will have to try it. I love all things lemon? Thanks, Sylvia! Glad you like it. This looks like the perfect summer dessert! 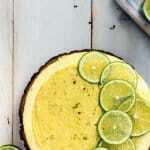 I love key limes – and that is one beautiful cheesecake! Thanks for sharing at the What’s for Dinner party. Hope your week is amazing! Hi, Helen! Thank you so much! Oh my word, this sounds like my kind of dessert. Pinning . I’d like to try this for the next time we have people round for dinner. I love love love Key Lime anything. This cheesecake looks so good. The lime curd topping is such a nice twist. Pinned. Thank you for sharing on Snickerdoodle Create Bake Make. I’m thrilled you think so, Amy! Many thanks! I Pinned this cheesecake and then had to see how it was made. I love limes and although we rarely get key limes here in the U.K. 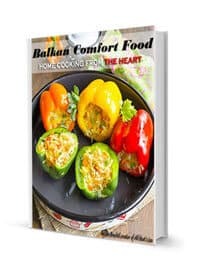 I want to try this recipe. This cheesecake looks scrumptious! Plus now I know the difference between the limes. And drag my fingers through it I would! You have a way with cheesecakes and I love it. 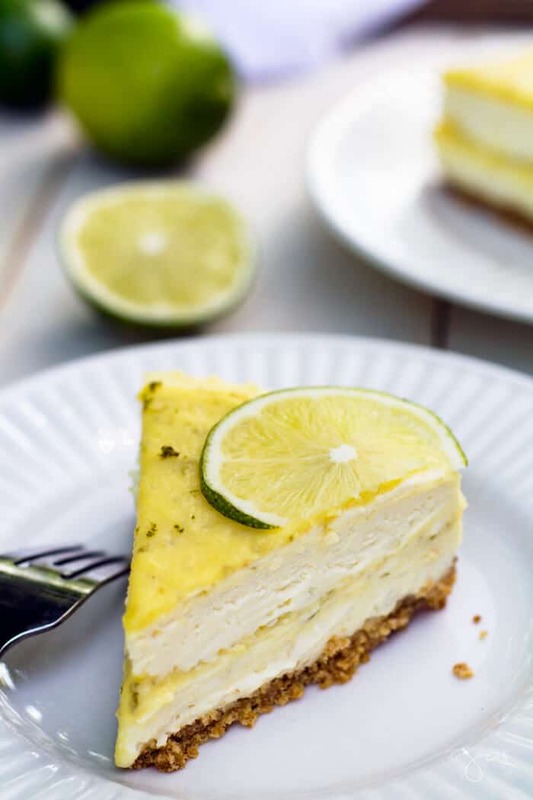 I was thinking a similar key lime thought with one of my posts as well. Thanks for joining us again at Celebrate Your Story, have a great weekend. Great minds…ha ha. Thank you so much, Sandra! Enjoy your weekend! Your cheesecake looks beautiful, Jas! I wish we could get key limes – I’ve never seen them in England but I always seek them out when we are in the US. I’d just love a slice of this with a cup of tea, it really does look lush! Scheduled to pin and share, including on the Hearth and Soul Facebook page. This recipe sounds and looks crazy delicious! Saved it and Featuring it at this week’s Merry Monday party! Thanks for sharing. Can’t wait to see what you’re up to next. 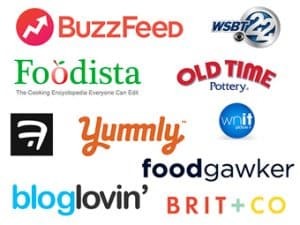 We sure have enjoyed featuring your awesome post on Full Plate Thursday this week. We have pinned your post to our features board and thank you so much for sharing it with us! Thanks for pinning, Miz Helen! Oops! One pinch of salt. Thanks for noticing, it is fixed now. Merry Christmas!